Clive Thompson’s latest book is Coders: The Making of a New Tribe and the Remaking of the World, from which this essay is adapted. 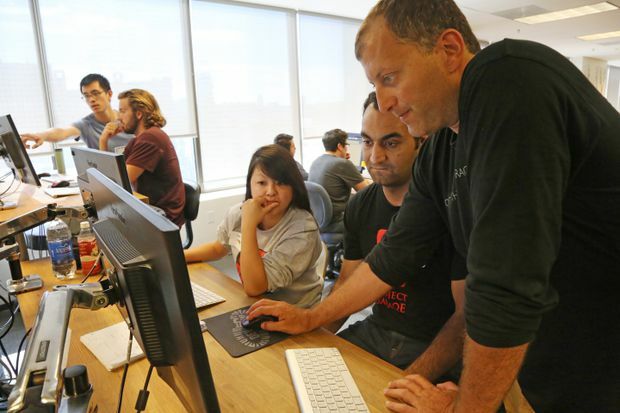 Instructor Sherif Abushadi, right, helps students Tina Tien, left, and Osman Afridi at Dev Bootcamp, in San Francisco in 2014. An orange-goateed 41-year-old, he lived not far from Pikeville, a town of 7,000 nestled in the winding green mountains of east Kentucky. For 15 years, he’d worked doing preventative maintenance on coal-mining equipment, but the coal industry had gone into a steep decline. In 2008, Kentucky had more than 17,000 coal miners; eight years later, it had only 6,500. What the heck? Someone was offering coding jobs – in Pikeville? The job offer was the brainchild of Rusty Justice. A salt-and-pepper 55-year-old at the time, he, too, had worked in mining his whole life, but was shaken by the decline. “We all saw a downturn coming, but we did not foresee the complete collapse of the economy,” he told me. 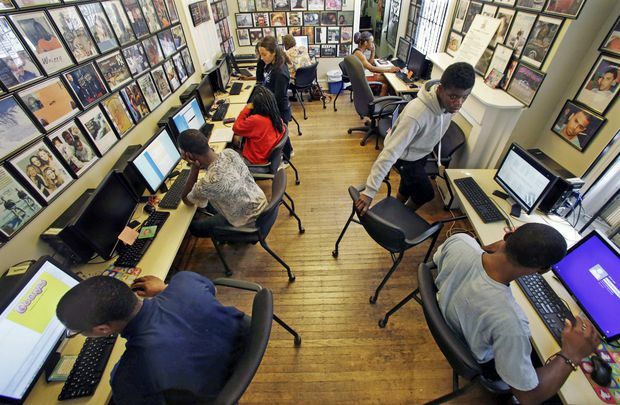 Students study at Hopeworks ‘N Camden, a nonprofit organization that teaches high school students and young adults how to build websites and use software, in Camden, N.J. in 2015. Mr. Justice realized he needed to build a completely new business in Pikeville, one in a growing field, that paid well: Mining jobs were US$82,000 on average, tentpoles for the whole economy, so the new jobs had to be like that. He pondered options such as wind farms and solar farms – then one day in 2013 visited a tech incubator in Lexington, a few hours away. Coding seemed like a great option, he said to the head of the incubator, but wouldn’t you need a computer-science degree to do it? Nope, said the incubator head. Anyone smart and committed could learn programming on the job, just like with any skilled trade. A light bulb went off. Mr. Justice knew that mining workers were intelligent, trainable and frankly already steeped in technology. “We’re perceived by people that we’re not smart, that we’re hillbillies,” he tells me. But coal miners already work like programmers: They sit in one place all day long, patiently running high-tech equipment and solving problems. “It’s a highly technological business,” he says. “You have this image of a guy who has a pickaxe and lunch bucket. But they use robotics, they understand fluid dynamics and hydraulics. Students in a coding class in 2016 at the Mid-Manhattan branch of the New York Public Library, in New York. So he and his partner set up their own tech firm in Pikeville. They’d find highly motivated laid-off miners, train them and then have a coding shop that could make websites or apps for anyone, anywhere. Mr. Justice hired a coder willing to train new staff, and lined up federal funds to pay the workers while they were training. They dubbed the company “Bit Source” as a play on the digital bit and the bitumen of mining. Would any miners want to be coders? When Mr. Justice put out the radio ads and print ads, “we figured we’d get maybe 50 applicants,” he says, “if we were lucky.” But they got 900. Stereotypes about hillbillies are, it turns out, precisely that; local residents were practically tripping over each other to compete for a job in software. They narrowed it down to 11 candidates, and offered them jobs. Garland Couch was one of those who made the cut. “From now on, you stop thinking of yourselves as unemployed coal workers,” Mr. Justice told them on his first day. “You’re technology workers.” Among the new hires were a mine-safety inspector, an underground miner and a college-educated mechanic who’d fixed conveyor belts in the mines. “It was kind of like trying to drink from a firehose,” William Stevens recalls. Mining was physically exhausting, but “this was mentally draining, the most mentally intense work that I’ve ever done.” Mr. Stevens had showed up at Bit Source after being laid off from a surface mine and hustling up a new mining job in a town three hours away. Slowly, the work began to make sense. They’d end each week by making a small project with what they’d learned – a simple webpage at first, then an interactive one, then ones that stored data in databases. Students collaborate on a project at the Flatiron School, whose computer coding students have been highly successful at finding jobs after their training, at the campus in New York in 2017. Mr. Justice was right: They were rapid, attentive learners. Mr. Stevens had discovered he loved front-end design, tweaking the CSS and fonts on a site for hours. “That whole experience of when you see someone’s face light up, that’s just awesome,” he gushes. Within months, they were shipping code. Much of it was, at first, simple – a website for Pikeville’s city council, sites for crane and earth-moving companies. But then it got steadily more complex, including an app that let patients redeem vouchers at farmers markets, an augmented-reality app and – in a bit of pro bono work deeply relevant to Kentucky – an app to help communities struggling with opioid addiction. Three years in, Mr. Justice’s investment was close to breaking even. But he’s convinced that Bit Source is, in its own small way, a glimpse of the next phase of coding. The first big wave was the pioneers, the rare nerdy kids who started with Commodore 64s or early HTML and parlayed it into millions. But now coding is mature. It’s become more of a ticket to the middle class; something that the great mass of people can see as a route to reasonably stable, enjoyable employment. It’s like, in other words, pretty much what mining used to be around Kentucky. Mr. Justice is right. The entire world of programming is now growing so quickly that it’s changing the nature of who becomes a coder, and why. Many students arriving to computer science reflect this shift. “It’s less of the, ‘Wow, I could become a billionaire,’ like we saw in the nineties,” says Eric Roberts, a long-time computer scientist. Now, it includes young people who see coding as a route out of the precariousness and low pay of jobs in the service-sector economy. Students attend Code Chrysalis, a software-coding boot camp, at a basement room in Tokyo, Japan in May, 2018. The demand for programmers is exploding worldwide. In Canada, it’s projected that there’ll be 200,000 unfulfilled coding jobs by next year. In the United States, it’s expected to be as high as one million. And these aren’t necessarily jobs making apps in Silicon Valley. These are coding jobs needed all over the country, in every city and every industry – banking, hospitality, you name it. The question is, how can we train as many people as the economy requires? University computer-science programs are the solid way to get trained – but there aren’t enough programs around. Community colleges are another excellent route, although they’re often underfunded and have trouble competing for teaching talent with tech firms. 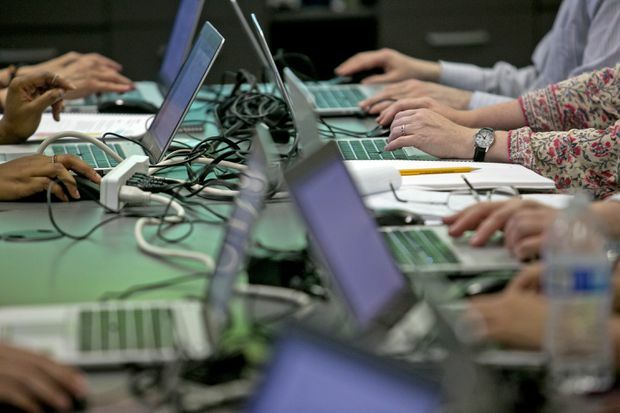 If provincial and state governments were smart, they’d invest heavily in community colleges, since these are historically powerful ways for lower-income groups to train in skills that are, like coding today, in high demand. But until that happens, it’s going to require being inventive. If you ask me, far more employers should go Mr. Justice’s route – hiring people who have aptitude and a hunger to learn, and training them on the job. One firm I spoke to in Baltimore, Catalyte, does precisely this: It offers a coding-aptitude test online, and anyone who scores highly is offered a training opportunity, with a job guaranteed on completion. It works quite well. Catalyte currently employs around 600 developers, and their demographics are remarkably more varied than the software industry at large. In their Baltimore office, 29 per cent of the developers are African-American, more than three times higher than estimates of the industry’s average. “Most are from working-class backgrounds,” says Jake Hsu, Catalyte’s chief executive, and 44 per cent didn’t do a four-year degree. The average age is 33 years old, with most of their hires seeking a second career, and a better one. “Talent truly is evenly distributed, or at least the aptitude to do this work is evenly distributed,” he notes. 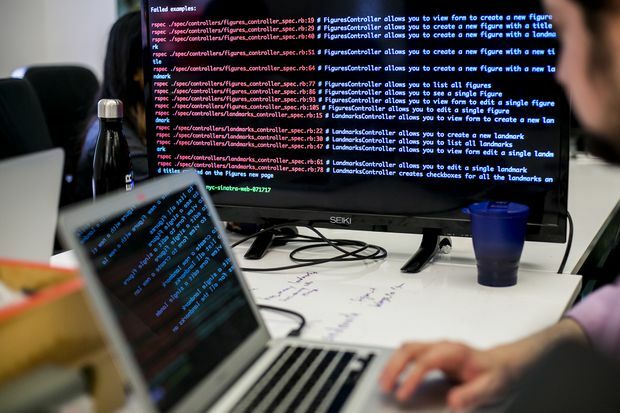 Another route into coding is the emerging world of “boot camps,” which take people interested in learning software development and putting them through an intense, several-weeks-long curriculum; tuition typically ranges around $12,000. It’s a “buyer beware” world here – some are fly-by-night operations – but the reputable ones have good track records, with many grads finding jobs writing software. 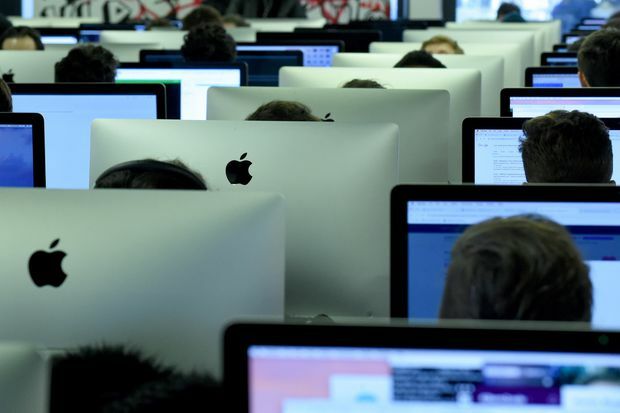 Student work on computers at the "Ecole 42" computer programming school in Paris on Feb. 19, 2019. And the other route that some are finding into software is simply teaching themselves. It’s not the easiest way in – it requires a lot of discipline, plus the free time to learn on your own – but in a survey by Stack Overflow, a programmer forum, fully 13 per cent of developers reported being “entirely” self-taught. What’s more, as Mr. Larson points out, teaching yourself a little bit of coding can be hugely useful in your existing job. It can be like a superpower, allowing you to automate repetitive, routine parts of your job, making you much more productive and valuable to your organization. You might have no desire to quit your job and become a software developer – but you could become far more effective in your existing job, be it marketing, nursing, or hospitality. Indeed, that’s how Mr. Larson himself got started in software. In his 20s, he ran English schools in China and then in Santa Barbara, and knew nothing about tech. “My wife configured the WiFi router,” he says. But he got annoyed at the many repetitive tasks he and the other employees had to engage in: cutting and pasting info into reports, formatting documents. So he read online how-tos on AutoHotkey macros, and soon he had crafted little shortcuts that saved staff hours each day. “Our school became more efficient – and then more popular, because our teachers were able to hang out with their students more,” he tells me. A web development coding class at Per Scholas, which offers free training for its students – 90 percent of whom are minorities – in information technology, in New York in May, 2018. Indeed, the market is poised to reward precisely this sort of employee – the one who can do a bit of scripting on the side. A report by Burning Glass Technologies, a job-market analysis firm, found that knowing some programming is now an advantage in 20 per cent of “career track” jobs. “I think that everyone should learn to code, even if they’re not going to work in it, because code is seeping into so many jobs,” Mr. Larson notes. “If you look at society, so much of the work’s being done by machines, and they’re just carrying out instructions.” It can’t hurt to become one of those who knows how to give them.